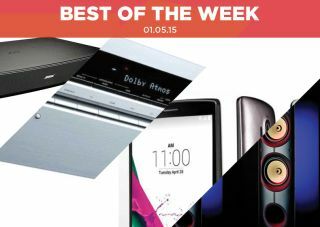 Best of the Week: Amazon Fire TV Stick, LG G4, Onkyo Atmos receiver and more What Hi-Fi? | What Hi-Fi? This week Onkyo revealed two of its entry-level AV receivers, LG unveiled its latest smartphone, the G4, and Sky announced it'll be closing its 3D channel later this year. On the reviews front we have plenty of products to get you through the May Day Bank Holiday with the Bose Solo 15 soundbase, PSB's Imagine X1T floorstander, Amazon's Fire TV Stick video streamer, TAD's DA-1000 DAC and a hands-on review of the LG G4. The first products from the Onkyo/Pioneer collaboration have been announced, with Onkyo set to introduce two new entry-level AV receivers. The TX-SR343 and TX-NR545 will go on sale in May for £249 and £449 respectively, the former arriving with built-in Bluetooth, DTS-HD Master Audio and Dolby TrueHD. The higher-specc'd NR545 comes with Dolby Atmos support making the NR545 the most affordable receiver in Onkyo's range with Atmos built-in. LG has taken the wraps off its G4 – the successor to last year's G3 – and it offers a number of tweaks and improvements with the most noticeable being a leather-backed finish. The screen features the same resolution as the G3 (2560x1440), but LG promise its new IPS Quantum panel will increase brightness by 25 per cent and offer more accurate colours. Storage is 32GB (but expandable) and the 3000mAh battery can be swapped out for another. A worldwide release is on the cards with an announcement on prices expected soon. 3D television has suffered another blow as Sky announced it's ditching its dedicated 3D channel. It follows on from last year's announcement that there would be no live football in 3D after substantial investment from the British broadcaster. Sky will pull the plug on the channel in June and will be moving all 3D content onto its On Demand platform. "...the Amazon Fire TV Stick is well worth your consideration"
When we reviewed the Fire TV a few months ago we came away liking it. Now we've tested the much (much) smaller Fire TV Stick and impressions are just as positive. Like Google's Chromecast (but with a remote) it slots into the back of your TV with minimum fuss. Apps are plentiful but really this is the Amazon show with their own-brand apps imposing themselves. Elsewhere we like the speed of operation, it's not as quick as the Fire TV box but we appreciate the slickness nonetheless. Video and sound are excellent, as we've come to expect from the online giant. This is more of the same from Amazon, but when it's this good we have little in the way of complaints. "The Solo 15 has been tuned in a way that makes it a really easy listen"
Bose's last effort in the soundbase market (the Bose Solo) was something of a disappointment back in the days when the term 'soundbase' hadn't even been coined. They're back with the Solo 15 and it's a marked improvement. The sound is better – the bass in particular deeper and more-controlled. Despite that it's lacking subtlety, and that's what separates the Solo 15 from its rivals. Nonetheless, this is a simple and straightforward way of improving a TV's sound. "The company clearly knows exactly what its customers want, and that’s a fun listen"
When you think of floorstanders what do they look like? Big, stocky, room-dominating speakers, right? With the Imagine X1T, Canadian hi-fi manufacturer PSB has gone in a smaller, more compact direction and the results are very good. The sound is energetic and lively, but the Imagine X1Ts aren't thelast word in subtlety and refinement. What they do offer is an infectious listen and we would wouldn't hesitate in recommending them if a fun sound is your priority. Entertaining and well worth investigating. "This TAD will give anything else we’ve heard a run for its money"
We'll ditch the preamble – the DA-1000 is one of the best DACs money can buy – if you can afford £12k, that is. If your budget can accommodate, what you get is a DAC that can unearth a staggering amount of detail, delivering music with real verve and gusto. Most of all it's fun. This TAD is a very accomplished piece of hi-fi.